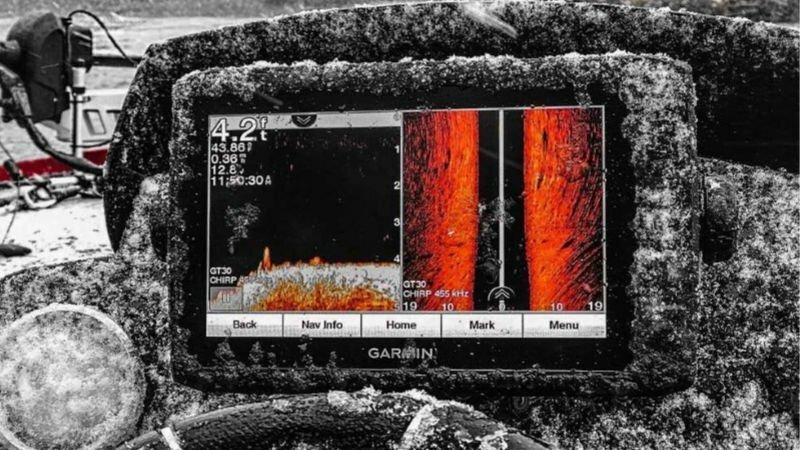 Garmin has given the echoMAP CHIRP series of fish finders a significant refresh. There are new sizes and loads of new features in these units, and they all look great. We sifted through the details to give you the full overview of these new units. There are five ECHOMAP Plus units to choose from. The addition of touchscreens to the 7 and 9-inch ECHOMAP Plus units is a substantial upgrade to the series. The old square 5-inch has been replaced by a widescreen 6-inch unit. Only the ECHOMAP 43cv remained mostly unchanged. 7” and 9” Touchscreen with Keypad – The 73cv, 73sv, and 93sv each have touchscreens. Slowly but surely, touchscreens are making their way down into the mid-priced fish finders. The Lowrance Elite Ti and Raymarine Axiom are the only other 7” and 9” units with a touchscreen. ECHOMAP Plus also has keys to work alongside touch, which I think was an excellent choice for user experience. 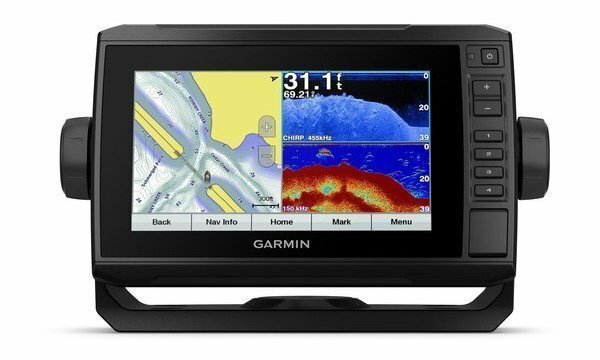 Ethernet Networking on 93xv and 73xv – Garmin’s online specs aren’t clear on this, but a pro staff member confirmed that the 9 and 7 have an Ethernet port, allowing the sharing of waypoint and sonar data with other Ethernet enable units. However, you can not share with older ECHOMAP or the smaller Plus units, as they only have the High Speed Serial sharing connections. 6″ replaces 5″ – The old square display has been upgraded to a 6″ widescreen. Dimensions – The physical dimensions are unchanged, but the styling has been updated. The rounded corners have been replaced by angular edges, much like the Humminbird Helix series. The button layout has changed, and there is more glass surface, presumably to make the touch screens fit. 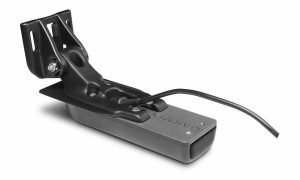 Quick Release Mounting – The connectors are attached directly to the mounting bracket, making it easy to mount and remove. Wi-Fi Connectivity – With the addition of Wi-Fi, that leaves Humminbird as the only units without wireless connectivity on their lower priced fish finders. You can download maps and software updates as well as connect to your smartphone apps and messaging. ActiveCaptain Mobile App – This new app is your link to accessing more maps. The app lets you update your maps or purchase new ones whenever you need them. You can upload, save, and share your Quickdraw map data, and connect with the community to download other user maps. You can choose to get your texts and phone calls displayed on the screen (why you would want that, I don’t know). 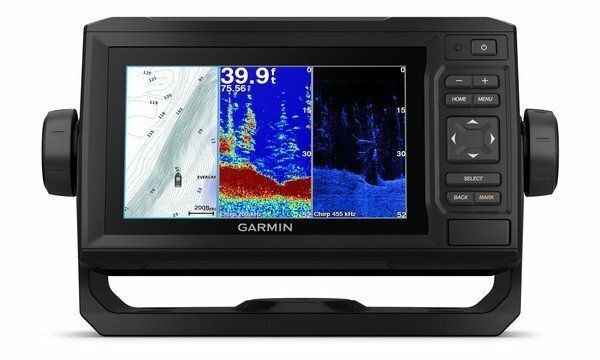 2019 Upgraded Transducers – Garmin has settled the patent disputes with Navico/Lowrance, allowing them to upgrade their transducers to the GT transducers with “real” ClearVü rather than a calculated image. 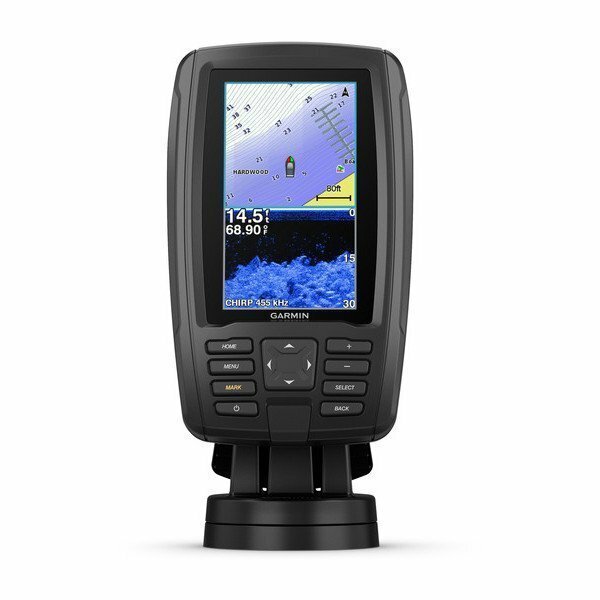 2019 Mapping – As of February, Garmin has released a new LakeVü HD G3 series of preloaded maps, covering 17,000 bodies of water, depth shading, shallow water highlight, and a cool looking Auto Guidance that calculates routes based on desired depth. The fish finders in the table are comparing the US versions that ship with inland LakeVü HD maps. For Bluechart G2 maps (Great Lakes and Coastal) just change the last digit to 4 (Example: 94sv). Likewise, for LakeVü HD Canada maps, change the last digit to 5 (Example: 95sv). All ECHOMAP Plus fish finders come with these basic items. Keep in mind for a complete install, you may need to purchase additional cables and accessories. The new Plus 93sv has the same $999.99 MSRP as the older version, but now with an awesome touchscreen/keypad combination. The 73sv MSRP of $749.99 is also unchanged from the previous year’s models. 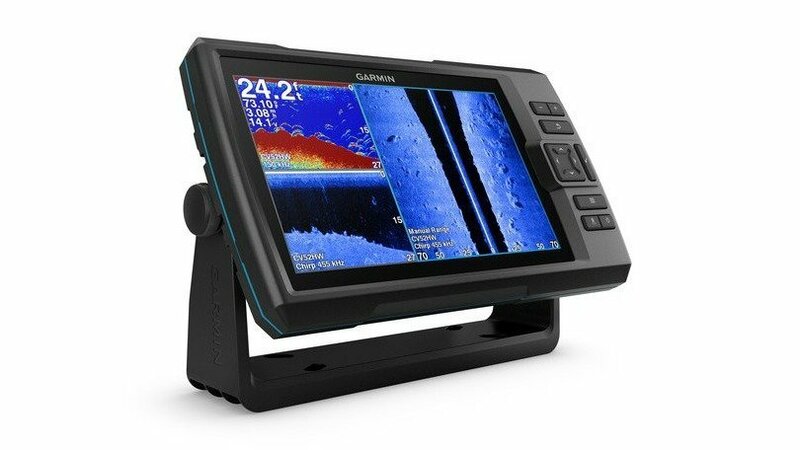 It’s pretty amazing touchscreen fish finders can now be had for under $1,000! Touch is great for quickly dropping and editing waypoints, but can sometimes be cumbersome in the rain or cold. Fortunately, ECHOMAP Plus also has keys to work alongside touch, which I think was an excellent choice for user experience. The 93sv and 73sv both have Wi-Fi connectivity for simple updating and connection to the new ActiveCaptain mapping app. There is 1 microSD card slot for saving recordings, waypoints, and Quickdraw data. You can now network ECHOMAP Plus and other fish finders using Ethernet networking cables. Sharing waypoints and sonar data is easier than ever, which is always an appreciated feature. The lawsuits between Garmin and Navico have finally been resolved, and the transducer has changed from the CV52HW-TM to the superior GT52. The difference is how ClearVü imaging is generated. The old transducer used a calculated image based on the two side crystals, whereas the new transducer produces a “true” down image from the dedicated down sonar crystal. Note: Consider adding a GT8HW-IH in hull transducer and Y-Cable to get 2D depth readings while running the boat on plane. Both SideVü units come preloaded with LakeVü HD G3 contour maps (17,000 HD lake maps with 1 foot contours) which is basically a $150+ value when you consider what a Navionics map card would cost you. You can also upgrade to LakeVü HD Ultra in either a downloadable update or an SD card. You’ll gain 4,000 more lakes with 1′ contours. LakeVü HD G3 allows you to highlight any depth zone you want using the Shallow Water Shading and Depth Range Shading. These tools are excellent in helping anglers quickly find similar structure and put together patterns. The 73cv and 63cv are the ClearVü only fish finders. The 73cv is also a touchscreen with keypad, while the 63cv is keypad only. The MSRP are set to $599.99 and $449.99 respectively. Both units have a MicroSD card slot, and amazingly both have Wi-Fi capability. Besides the touchscreen, the other major difference is the transducer. The 73cv bundle includes the GT22 transducer, which is capable of CHIRP traditional sonar, and CHIRP ClearVü sonar. The 63cv bundle, on the other hand, is fully CHIRP capable but comes with the GT20, which does NOT have CHIRP 2D sonar. It has just the traditional 77/200 kHz dual beam plus CHIRP ClearVü. You can buy the unit without a transducer and buy the GT22 transducer to get that feature. 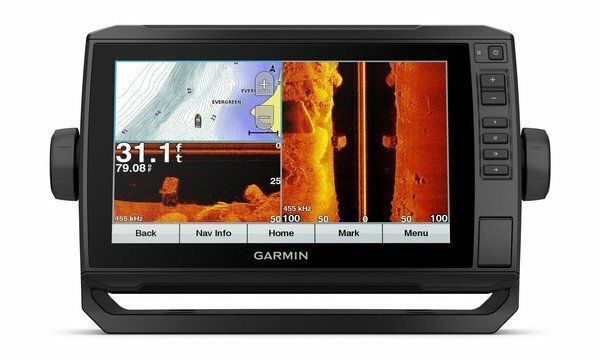 These units have the same great LakeVü HD G3 maps already loaded into memory, all you have to do is install the fish finder and go. If you like to make your own maps, Quickdraw is at the ready. Save sonar recordings and waypoints on the single memory slot. 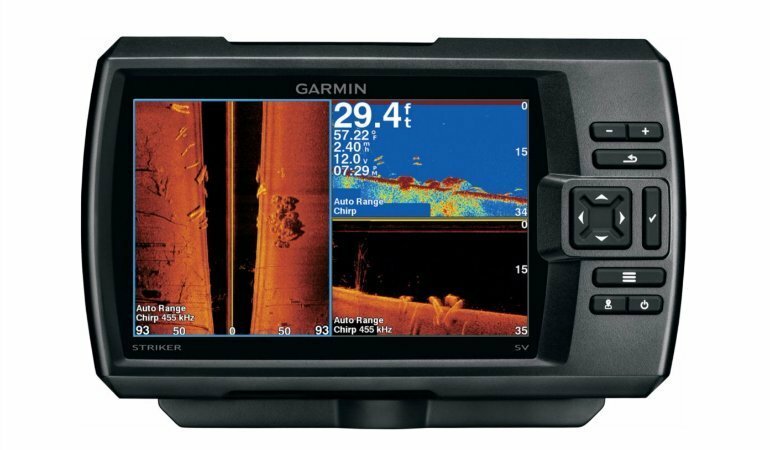 This little depth finder is packed with features. For an MSRP of $299.99, you get mapping, CHIRP sonar, Quickdraw, and MicroSD storage. This is a great option for a small boat or kayak fish finder. The only problem with the 43cv, is the included transducer isn’t as good as the unit it’s replacing. You’ll have to buy it without the transducer and get the GT22 to get all the CHIRP sonar capabilities. Or try to find a clearance echoMAP CHIRP 43cv. Should you Buy a Garmin ECHOMAP Plus? If you liked the original ECHOMAP Chirp units, you should love the Plus. You get the same excellent CHIRP 2D sonar, CHIRP imaging, and easy to use touch screens on the 73cv, 73sv, and 93sv units. All of this comes at a surprisingly competitive price. The new ECHOMAP Plus 93sv and 73sv have an MSRP identical to the units they are replacing. The upgraded transducers with a dedicated imaging beam for ClearVü is great, you can finally enjoy real down imaging on a Garmin. The upgraded LakeVü HD G3 mapping is an excellent value no other brand offers. Add in the Quickdraw live mapping, and there really is solid mapping capabilities for everyone. The ECHOMAP Plus is also one of the few mid-priced fish finders with Wi-Fi connectivity. This makes downloading maps and software updates stupid simple. If having the best imaging picture is important to you, look at the HELIX MEGA units. The images look good enough on the ECHOMAP Plus, they just aren’t nearly as clear or sharp as with MEGA Imaging. There is only one tiny MicroSD card slot on the ECHOMAP Plus fish finders, and from experience, I know how careful you need to be inserting and removing them. One other small beef is with the very basic transducer that ships with the 43cv and 63cv. It only has regular 2D sonar in 200 and 77 kHz, not in CHIRP. You will have to buy without a transducer and upgrade to get those benefits. 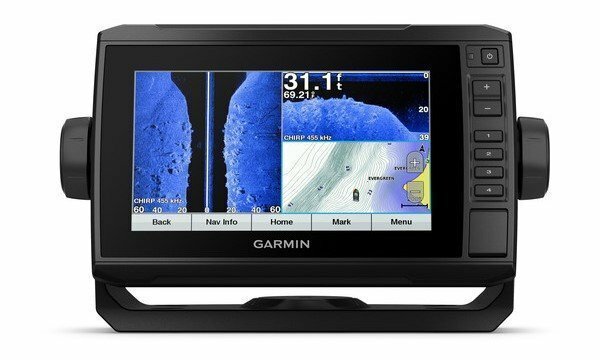 Bottom Line – With excellent CHIRP sonar and touchscreens moving into the 73sv and 93sv models, all for an attractive price, it’s apparent that ECHOMAP Plus series will be another winner for Garmin. The 63cv and 43cv aren’t bad either and should work quite well on a kayak or smaller fishing boat. Is a Wi-Fi feature in ECHOMAP Plus 73cv/63cv or not?? In the https://buy.garmin.com/en-US/US/p/529885#specs I fond – no Wi-Fi. In yoy review above – yes . What is the truth???? Your Amazon link for the 93 is misleading. That is NOT the “Plus” unit, but the older one. It’s not misleading, just an error. Thanks for letting me know, the link has been corrected. 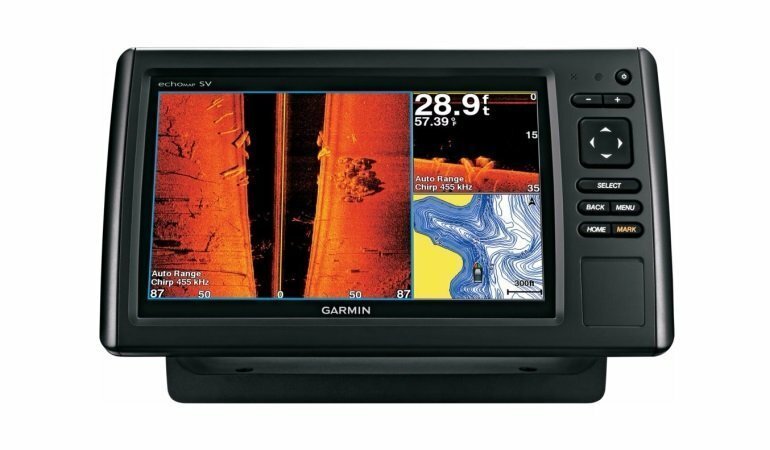 I bought a used boat with a Garmin Echomap 93sv in it. There is no card in it. Is there still maps loaded in it? How can I get newest version of maps? There should still be the preloaded maps on the unit. I would check here first, then contact Garmin if still having trouble.